Are you thinking about fall yet? If you’re not, you should be, while I want to make sure I get the most out of summer I also want to make sure I get first dibs on this falls hottest trends. Zoya just released their fall 2018 collection ELEMENT that features 12 new colors. I have noticed that as fall releases come out mauves, reds, purples and pinks are making a dominant statement. All of the colors I used two coats with. Rumor is a pink/mauve color with a frost meets shimmer finish. It definitely shows brushstrokes, but I think it adds a lot of dimension. I really loved this hue. Jenna is a muted rose pink crème. Ruthie is a crème based berry rose shade. Maryann is a rose pink shimmer. Donnie is a purplish red crème. Maeve is a grape pop purple crème. Kendra is a deep red crème. Alyssa is a cranberry red crème. Rachel is a vampy red crème. Gardener is a pinkish periwinkle shimmer with a foil finish. Going to pair this with Maize (yellow) for University of Michigan games. I was a little underwhelmed with this collection, not because I hate the colors I actually really love them. 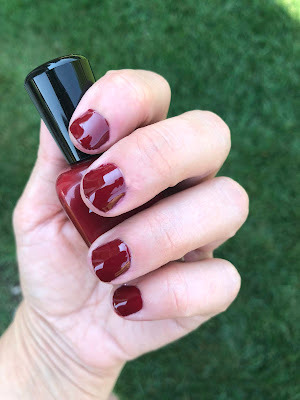 For me personally when it comes to fall I love vampy colors which makes Leighton and Rachel my favorites of the collection.